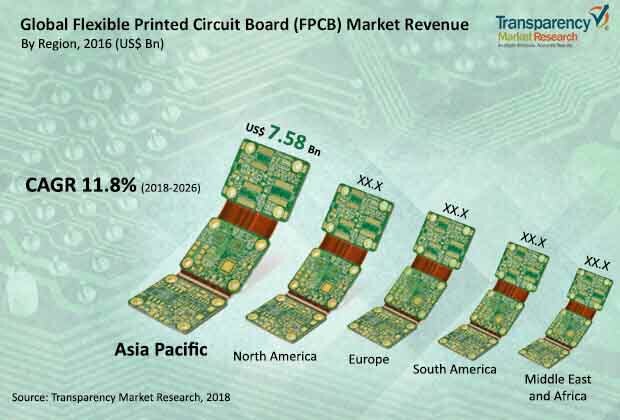 As per the research report, the global market for flexible printed circuit boards, which was worth US$14.51 bn in 2017, anticipated to expand at a CAGR of 11.80% over the period from 2018 to 2026 and reach a value of US$38.27 bn by the end of the period of the forecast. Among the products available in this market, multi-layer flex circuits enjoy a greater demand and this trend is projected to remain so over the next few years. The instrumentation and medical, computer and data storage, telecommunication, defense and aerospace, consumer electronics, automotive, and the industrial electronics sectors have emerged as the leading end users of flexible printed circuit boards across the world. Geographically, Asia Pacific has been dominating the global market over the last few years and researchers anticipate this scenario to continue in the near future, states the research report. “The significant rise in the consumer electronics industry, led by the growing demand for smartphones, tablets, and LCD displays, in has been influencing the sales of flexible printed circuit boards substantially, says the author of this study. These boards find noticeable application in mechanically supporting and electronically connecting a number of electronic components with the help of conductive pathways, which, in turn, is reflecting on their demand substantially. The increasing awareness among consumers regarding the advantages of these boards, such as compact design and low weight, in comparison with rigid or conventional PCBs is likely to boost the growth of the global flexible printed circuit boards market in the years to come, reports the research study. Multi-layer flex circuits enjoy a greater demand. Asia Pacific has been dominating the global market.